When I was approached about reviewing The Real Wizard of Oz : The Life and Times of L. Frank Baum I leapt at the chance! Like all of you, I'm sure, I grew up watching Judy Garland portray the sad but charming Dorothy who is frolicking with munchkins, scarecrows, tin men and lions on her quest to get to the Emerald City. I know the story by heart, or, at least the movie version of it. However, I had never read the original story before. Not wishing to set the cart before the horse, I read The Wonderful Wizard of Oz (see my review of it by clicking on the title) in preparation for reading The Real Wizard of Oz . As I mentioned in my review of The Wonderful Wizard of Oz, I thought it was strange and nonsensical. I was really surprised that the book became a best seller to the extent that Hollywood would sit up and take notice. Now that I've read about the man behind Oz though, I'm not as surprised. I AM glad that I read his book before I read about him. Written by Rebecca Loncraine, The Real Wizard of Oz paints Baum out to be something of a absent minded professor type. Clearly Baum had some imagination about him and he wrote in such a way as to engage his young readers and dazzle them with magic in other worlds. He was heralded as being a modern day fairy-teller, likened to Hans Christian Anderson. I've read Anderson's fairy-tales and I don't really see the comparison but there it is! According to Loncraine, it is how his work has generally been accepted in America. Baum was an interesting man to be sure and Loncraine uses her own writing skills and style (which is very unique) to make you want to pay attention to the details of his life. You know how some biographies can be so bland that you just graze through, hoping to pick up a little bit? Loncraine definitely uses her words in interesting ways and writes very descriptively so that there were few things that I missed about Baum's life - including little things like the fact that he very much liked one of his relatives' cottage cheese. That said, her writing style is often so flowery that I had a hard time keeping his relatives straight and I can't tell you which it was that made the aforementioned cottage cheese. The first part of the book opens up by talking about his relatives and family history, but figuring out who was who was somewhat difficult, simply because Loncraine's style. However, the writing smooths out and it's easy to pick up the pace. She certainly keeps the reading audience interested in the material. The one truly great thing about Baum was his love and faithfulness to his wife. They were married for thirty-seven years before he died (in 1919) and they seem to have had a wonderful marriage in the sense of their faithfulness to and great happiness with one another. He repeatedly assured her that she was the only woman that he could and ever did love. She missed him greatly when he died. His wife, Maud, was able to see Oz come to life in the 1939 production with Judy Garland. Publicity photos show Maud and Judy reading The Wonderful Wizard of Oz together. 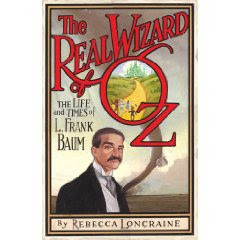 On the whole, I thought this biography of L. Frank Baum was very intriguing. He seems a man that was hard to know, despite the fame and attention to his life. He certainly lived through a lot over the course of his lifetime (the Civil War, the Industrial Revolution, etc.). As Loncrain points out in this book, there is a lot that we will likely never know about Baum because his imagination worked overtime -- even when he was giving interviews to reporters. He painted things as he wanted to see them for his reading public and that will always mask who the man is to some extent. However, for her part, Loncraine does a pretty decent job at presenting as many facts as are possible, being quick to point out when the facts are unknown. I liked that. I'm glad to have read The Real Wizard of Oz . It didn't make me like the man or his writings, particularly, but it did help me to understand the phenomenon which is Oz and therefore I appreciate it very much. Click here to see my review of The Wonderful Wizard of Oz. Great review - very intriguing and interesting subject matter.